With the upcoming Intel Grantsdale and Alderwood chipsets will come the first appearance of DDR2 memory and a new CPU socket 775. While the boards are not here yet, the memory is! Kingston is the first to announce shipments of next-generation 533Mhz DDR2 memory, and while it is too early to report test results in unreleased chipsets, we can show you what DDR2 actually looks like and discuss the features and specifications. Cebit 2004 is in full swing in Germany, and Kingston is showing their recently announced DDR2 modules. While specifications for DDR2 have been available for quite a while, this is our first chance to take a closer look at shipping DDR2 modules. New DDR2 is at the top of the picture and current DDR is at the bottom. DDR and DDR2 are exactly the same width, which will certainly generate some confusion at first. You can see that DDR2 has a denser 240-pin edge connector, while current DDR uses a 184-pin connector. If you look closely, you can see the notch is in a different location on DDR2. The relocated notch is to prevent inserting DDR2 accidentally into boards designed for DDR. With voltage for DDR2 set at 1.8V, it would not be a good idea to mount DDR2 in a DDR socket designed for 2.5V. 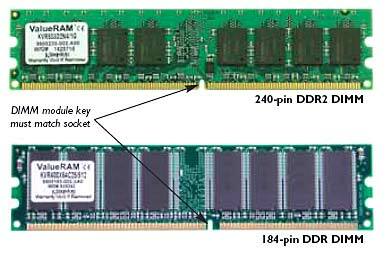 DDR2 is a standard developed by JEDEC, which is the standards organization for the memory industry. Since the standard is published, there are already established speeds and naming conventions for DDR2 memory. With the hot, possibly speed limited (where's that 3.4?) Prescott and double cost slower memory not forgetting PCI-E costs and problems, looks like intel may have got themselves another rambus/willamette scenario. With dual channel Sckt939 newcastle, nF3-250 fron nVidia and DDR1-550 coming from Hynix, lets hope AMD can profit this time. Although initially its sure to be both more expensive and provide little if any performance benefit over standard DDR, its clear that pairing up a bandwidth-hungry P4 processor with DDR2 memory will become the norm within a year and we'll be looking at DDR only mobos for them by then in much the same way as we considered PC100/PC133 SDRAM ones a couple of years ago. bob, they don't expect much yet. they're getting ready for when the ddr-2 chipsets *are* out.